The St. Louis Cardinals announced infielder Jhonny Peralta has been placed on the 15-day disabled list with a ligament strain in his left thumb, retroactive to July 18. In addition, rookie outfielder Jeremy Hazelbaker and right-handed pitcher Miguel Socolovich have been recalled from Memphis (AAA) and will be active for tonight’s game against the San Diego Padres. To make room on the team’s 25-man Major League roster, catcher Michael McKenry was designated for assignment. Peralta, 34, missed the first 57 games of the 2016 season with left thumb ligament surgery before returning to the Cardinals on June 7. 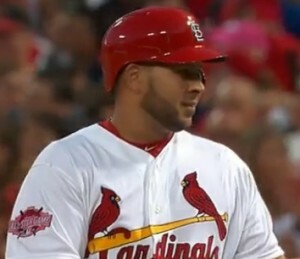 Upon his return, Peralta played in 30 games, starting 28 at third base while batting .221 with five home runs and 13 RBI. Last Saturday, Peralta hit his 199th career home run. Hazelbaker, 28, was on the Cardinals Opening Day roster and played in 61 games, starting 44, at three different outfield positions. He batted .250 with seven home runs and 19 RBI before being optioned to Memphis following the game on June 15. Hazelbaker still ranks among Major League Baseball pinch-hit leaders in home runs (3, T2nd), batting (.368, T6th) and RBI (6, T4th). A veteran of 751 minor league games entering the 2016 season, Hazelbaker played in 13 games at Memphis following his option, batting .325 with a home run and 11 RBI and a .913 on base+slugging mark. Socolovich, who turns 30 on Sunday, made 35 relief appearances for Memphis this season posting a 2-5 record with a 2.79 ERA and three saves hurling 38.2 innings with 40 strikeouts. The Caracas, Venezuela native appeared in 28 games in St. Louis in 2015 with a 1.82 ERA. McKenry, 31, appeared in three games since his promotion on July 7, with one sacrifice bunt in two plate appearances.